ArtBuilt, in partnership with NYC Parks, Queens Museum, The Women’s Housing and Economic Development Corporation (WHEDco), DreamYard, Lower Manhattan Cultural Council (LMCC), Seward Park Conservancy, and Immigrant Social Services (ISSNYC), is now accepting proposals for: Studio in the Park for summer and fall 2018. 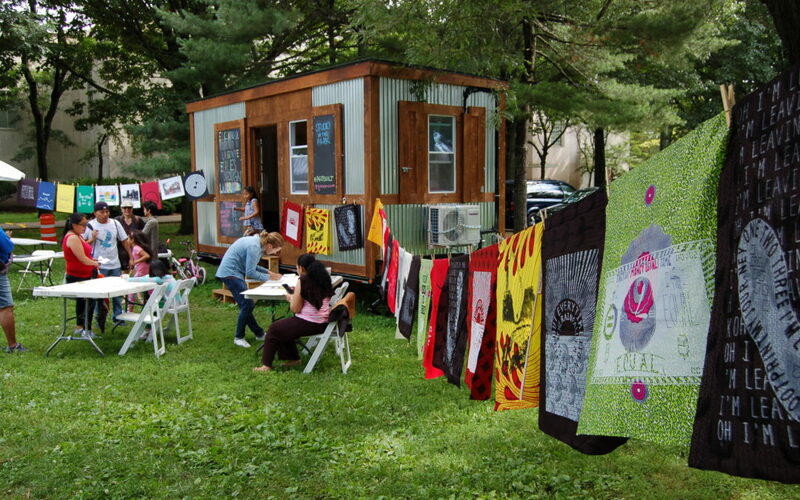 Studio in the Park is a residency program operated since 2015 by Queens Museum, ArtBuilt and NYC Parks, providing an artist or artist collective use of a 150 square foot mobile studio space, situated in an NYC public park, to carry out a community engaged art project over the course of 6 weeks. In 2018, project sites will be: Seward Park in Lower Manhattan; Railroad Park in Morrisania, Bronx; and Flushing Meadows Corona Park (adjacent to Queens Museum). The ArtBuilt Studio in the Park residency began in 2015 in partnership with the Queens Museum. With the receipt of a prestigious OUR TOWN grant from the NEA, we will expand this residency to all five boroughs in 2018 and 2019. More information about the participating parks here. Project should serve the diverse immigrant communities that surround the park, which have become threatened by a climate of increasing xenophobia and shifting immigration enforcement. Preference will be given to projects that not only create a dignified and safe environment for immigrant families, but also involve creative forms of service provision or referral, immigrant rights and legal education, risk reduction, tools for emergency planning, and/or engage the general public in ways they can actively support immigrants’ human rights. Project should address ways in which neighborhoods adjacent to park are changing in response to rising rents and property values. How can existing communities respond to displacement of lower income residents by more affluent newcomers? As existing local businesses and amenities change to cater to new residents, who benefits? What rights do existing residents have to their communities? What obligations do newcomers have to their new communities? How can residents with decades of history in the neighborhood continue to shape local culture in the face of rapid change? Project should connect with the (often varied) cultural traditions of communities surrounding the park. Who are local residents and where do they come from? Are their voices part of the local narrative? In a time when immigration has taken center stage, how can migrant communities express pride in their cultural practices? What role can artistic expression play in maintaining and preserving the cultural heritage – traditions, customs, legacy, foods, language – of diverse cultural groups for future generations? How can an art project help foster cultural appreciation, community engagement, and neighborhood pride? Artists are welcome to propose projects that align with their existing practice, but which also connect to the local community in a real way. Examples might include: Relationships among and between different groups in the neighborhood; facilitating community dialogue through art-based strategies; issues of connectivity (community connection); building intergenerational communication and learning. Artists should feel free to propose any project that meaningfully connects with the neighborhood. • A mobile studio space for 4-6 weeks situated next to the artist’s assigned park. The light-filled mobile studio offers electricity, air conditioning, wi-fi (site dependent), and ample wall space. • Support from ArtBuilt, Queens Museum, NYC Parks, and project partners for public engagement, event production and promotion. Selection: In consultation with local stakeholders, a panel of arts professionals will review applications and select residency participants. The panel will include Queens Museum staff, ArtBuilt staff, and NYC Parks public art staff. Selections will be announced in early May 2018. • Artists who are working in painting, drawing, sculpture, printmaking, photography, multimedia, installation, public art, participatory art, socially-engaged art and arts-based research, performance-based visual expression, folk and traditional cultural practice. • Artists who are residents of New York City—from any of the five boroughs—and who have resided in the City for at least one year prior to the application deadline. Artists must reside in NYC during the entire residency period. Ready to apply? Submit here!